Thankyou to each and everyone of you that support ArtsCape and its programs. Without your continued support our committee could not bring to you the wide range of programs though the year. 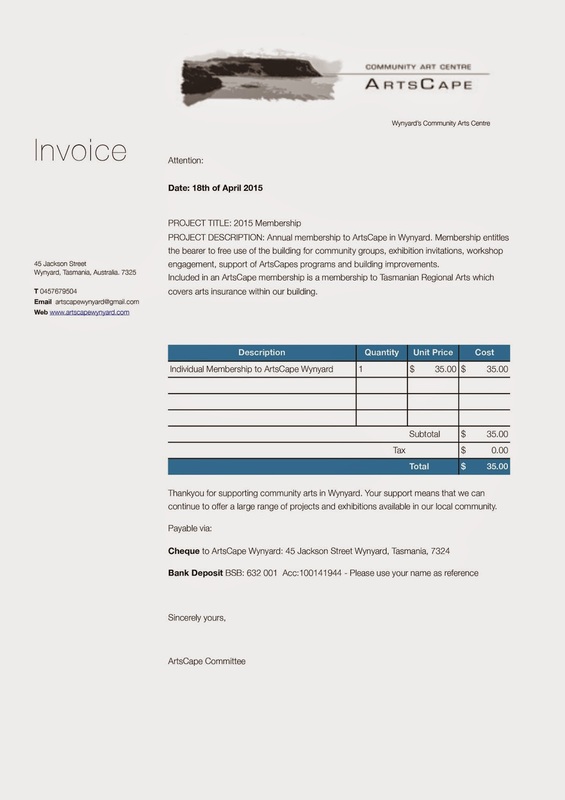 Very shortly we will be sending out invoices to our past members who have not resigned up to our membership program for 2015. We would really appreciate if this could be rectified as soon as possible. If you are currently not a member then we would also love for you to become one. You will find all the details on the invoice attached. By becoming a member to ArtsCape you are directly supporting grass roots arts programs. We are a not for profit organisation that is run by a dedicated committee of volunteers. We strive to bring the best in community exhibition programs, events and workshops whist offering a home to all arts practices in our region. We welcome all to get involved in our group regardless of age, arts practice or skill level. We love to help first time exhibitors with their first exhibition and open our doors to community groups needing space. We are open to anyone sitting on our committee and working with us to provide quality arts programing for Wynyard Tasmania.